In my series on the Vijayanagara Empire, I had earlier covered the interim period showcasing the Saluva, Tuluva dynasties. Now we shall look at the rise of one of the greatest emperors of Vijayanagara, and also one of greatest rulers of India, Sri Krishna Deva Raya, under whose reign Vijayanagara attained greatest heights. His reign was marked by military conquests, patronage of arts and culture and flourishing of literature. It is no wonder that his reign was called Golden Age of Vijayanagara. I had covered the rise of Tuluva Narasa Nayaka in my previous article, showing his rise under Saluva Narasimha Raya, and how he laid the foundation for one of Vijayanagara’s most famous dynasty. Much before Sri Krishna Deva Raya ascended the throne, however his elder brother Vira Narasimha Raya ruled for a brief period of 4 yrs between 1505 and 1509. Not really is known much about Vira Narasimha Raya, except that he spent a good amount of his reign in fighting off rebellious chieftains and the Bahmani Sultans. One of his early challenges, was from the Bijapur Sultan, Yusuf Adil Khan, who tried to extend beyond the Tunghabhadra, however with the help of Aliya Rama Raya, who would later be Sri Krishna Deva Raya’s son in law, Adil Khan was beaten back, and Adoni became part of Vijayanagara. The more tricky part was the revolt by chieftains of Ummatur, for which Narasimha Raya set out with an expedition, and received help from the Portugese in terms of artillery and horses, in quelling the revolt. There is a back story of how Vira Narasimha Raya, on his deathbed, wanted, his 8 yr old son to be next ruler, and asked the faithful minister Timmarasu, to put his brother Krishna Deva Raya to death. And then Timmarasu, killed a goat, showed it’s eyes to Narasimha Raya, who was overcome by remorse, and apparently he was relieved when told that Krishna Deva Raya was alive. However that story seems more of a legend, with no historical evidence to back up. Sri Krishna Deva Raya ascended the throne in 1509, as per most historical accounts, it was believed to be on Krishnashtami day as per the Hindu calendar. He was the mightiest ruler of the Vijayanagara Empire, with a well built personality, who kept himself fit through rigorous physical exercise. A strong muscular body that he developed through use of Indian clubs, an expert swordsman, a fine horse rider, he had a charisma and majesty, that made people be in awe of him. Be it the Portuguese traders, the Gajapati rulers who were his opponents, his nobles, his ministers, everyone was swayed by his sheer personality and character. He was also one of the finest warriors on battlefield leading from the front, plunging straight into enemy ranks with a dare devilry and recklessness that put his life in risk. He was known for his statesman like nature, his gentleness, wisdom, his sense of justice, and also a ruthless nature. 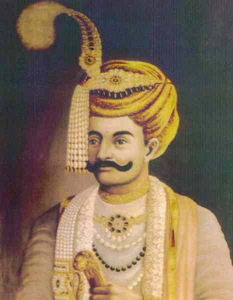 It was also to his credit that during his reign he was assisted by some of the finest men around him, be it the wise minister Timmarasu who was his adviser and guide or the gallant military commander Pemmasani Ramalinga Nayaka, who led the army to one of of it’s finest victories in the Battle of Raichur. Sri Krishna Deva Raya, initially subdued most of the rebellious local chieftains like the Ummatur ruler, Ganga Raju who was defeated on the banks of the Kaveri, and the Velamas of Bhuvanagiri. Bhatkal Beach, was an important trading post. One of the interesting features of Sri Krishna Deva Raya’s reign was the tactical, strategic partnership he had with the Portuguese, who were then establishing themselves on the West Coast. 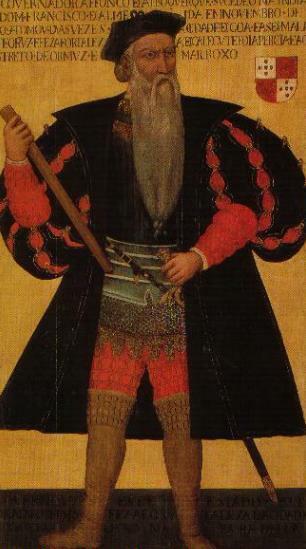 At the same time Sri Krishna Deva Raya, ascended the throne in 1509, on the West Coast, Albuquerque was appointed the Governor overlooking the Portuguese settlements. The Portugese had earlier assisted Krishna Deva Raya’s brother Vira Narasimha in his campaign against Yusufl Adil Khan, and they had got the important port of Bhaktal on West Coast in return. Albuqurque assured Sri Krishna Deva Raya, assistance with Arab and Persian horses, as well as artillery in his battle against their common enemy, the Bahmani Sultans. In March 1510, Albuquerque successfully managed to capture Goa from the Bijapur sultan , Adil Shah, however the latter struck back after 2 months, and were able to recapture Goa, forcing Albuquerque to flee not before inflicting heavy casualties on the Muslims there though. However in November with Bijapur facing it’s own civil strife, Albuquerque managed to re take Goa once again, and defeated Rasool Khan, the Governor of Goa. 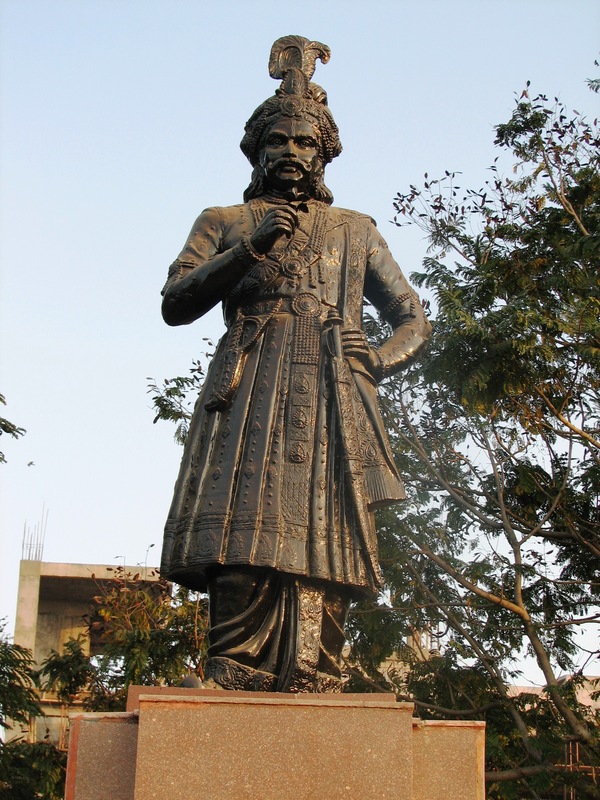 Krishnadeva Raya, congratulated Albuquerque on his success in Goa, and also gave permission to the Portugese to build a fort at Bhatkal, which was one of the critical trading posts. It was more of a strategic tie up, the Portuguese had those fine Arab, Persian horses, which he needed in his campaign against the Bahmanis, as well as artillery. Another important fact was that friendly relations with Portuguese gave Vijayanagara access to Bhatkal, which helped in the trade. During this time, Duarte Barbosa, a cousin of Ferdinand Magellan, visited Vijayanagara and gave his own accounts of the capital. Bhatkal became the chief port for Vijayanagara, and while they exported iron, spices, drugs, they in turn imported horses and pearls, Krishna Deva Raya’s own nephew was the Governor there. Another benefit of his alliance with the Portuguese was their assistance in improving water supply to Vijayanagara through a network of aqueducts and canals. Conflict with the Gajapati Rulers. Statue of Sri Krishna Deva Raya with his wives Chinamma Devi and Tirumala Devi at Tirumala Balaji temple. One of his greatest challenges was the Gajapati kingdom that lay to the east of Vijayanagara, and covered Odisha, parts of Telangana, and the entire Coastal Andhra. Ever since the foundation of Vijayanagara, there were constant conflicts between them and the Gajapati rulers for control over Telangana, as well as the fertile Coastal Andhra plains. The battles between them often resulted in tactical alliances with the Bahmani rulers, playing off one against another. The success against the Ummatur Rajah, who had long been a thorn in the flesh of Vijayanagara, gave Sri Krishna Deva Raya, the necessary impetus and motivation to strike against the Gajapatis. Udayagiri( now in Nellore district) was the first fort to be attacked, located on a steep hill, was inaccessible from all other sides. The only way it could be reached was through a thick jungle trail on the eastern side, and a pathway on the western side. Around 1513, Sri Krishna Deva Raya, led a long siege against Udayagiri, that lasted for 18 months, forcing the Gajapati army to surrender after reducing them to starvation and cutting off the food stocks. In commemoration of his victory at Udayagiri, Sri Krishna Deva Raya offered prayers at Tirumala Balaji temple, along with his wives, Tirumala Devi and Chinamma Devi, there is a statue of the emperor there to date. After Udayagiri, Sri Krishna Deva Raya, then proceeded to another hill fort of Kondavidu( now in Guntur district), under the Gajapatis, and laid siege to it for two months. Launching a concerted assault, on the fort, Sri Krishna Deva Raya led from the front, encountering fierce resistance from Virabhadra, the son of the Gajapati ruler Pratapa Rudra Deva. The Vijayanagara army initially suffered reverses from the stout defense put up by the Gajapatis, however Krishna Deva Raya’s wise minister Timmarasu, managed to find a secret way to the fort’s eastern gate, and a surprise attack was launched during night time. Kondavidu fell to the Vijayanagar Army around 1515, and Sri Krishna Deva Raya appointed Timmarasu as the Governor there. 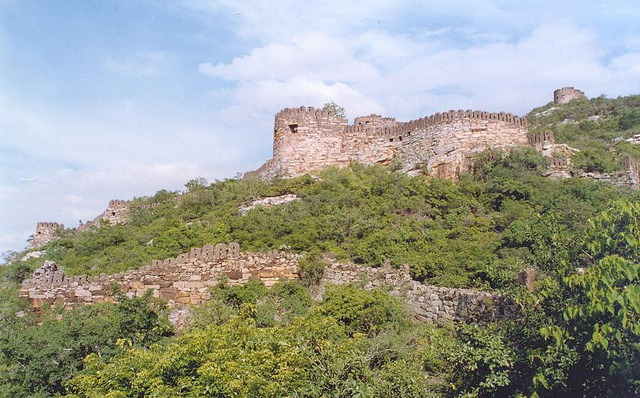 Another hill fort, Kondapalli( now in Krishna dt) under Gajapati rule, was attacked, and a siege was carried out. However, with Pratapa Rudra engaged in repulsing an attack by the Bengal Sultan, Allaudin Hussan Shah, it proved to be some what easy, for Krishna Deva Raya, compared to Udayagiri and Kondavidu to capture it in 1515. Rajahmundry too was soon captured back from the Gajapatis, and then in 1519, Pratapa Rudra had to suffer a defeat at hands of Krishna Deva Raya, and surrendered. He in turn gave his daughter Annapurna Devi in marriage to Sri Krishna Deva Raya, and thus an alliance was formed between the Vijayanagara and Gajapati kingdoms. In next part of this, would look at Sri Krishna Deva Raya’s victories against Bahmani Sultans, and the Battle of Raichur. This entry was posted in Indian History, Medieval India, Vijayanagara Empire. Bookmark the permalink. I find the siege on Udayagiri very dear to me. It is during the same time that the army of Krishna Deva Raya made barracks towards the coast, constructed a port for their trade and slowly people began settling around the area, which is my hometown, Kavali. We got that name because we protected the cargo of Vijayanagara empire from the port to the fort of Udayagiri, which again, as pointed out, is a mammoth to conquer given its strategic position. Unfortunately, there is nothing left that can be looked at in awe in the fort now. But the hike towards it is awesome. Visit the fort once if you can find time. Those interested in Vijayanagar empire must visit Chandragiri Fort near Tirupati (about 10 km from the town). This fort is one of those few forts which have been preserved well by ASI. We can see the weapons and artifacts of that time displayed in the museum. Chandragiri was once a flourishing city and served as a bastion for the Vijayanagara empire. Infact the city of Chennai was gifted as a trading post to the British by the king of Chandragiri with a request to name it after his Late Father Chennaraja. Hence, the name Chennai. Not much is known about Anna purna devi wife of Krishna Deva raya. In Tirupathi temple bronze statues of Krishna deva raya and his wives, Tirumala devi and Cinna devi are prerved. Anna purna devi was the daughter of Prataparudra Gajapathi the king of Orissa. He was defeated by Krishna Deva raya and Anna purna devi was given in marriage by her father Gajapathi the king. As per legends she was much forced by her father to murder her husband on her first night although she was reluctant. On the fateful night, She attempted suicide with a knife after entering the chamber of her husband. Hwever Krishna deva raya who wa expecting some conspiracy of this sort prevented her from stabbing herself. Gajapathi was much upet over her failure and harboured deep grudge over Raya. In Telugu cinema Mahamantri timmarusu, the episode as been filmed. But there is no historical records to the effect. Anna purna devi was also called Tukka devi probably. It is learnt that Raya and Tukka devi did not live togeter and she stayed separately. Was it due to strained relations between them. Not known. In recorded history nothing is written about Tukka devi. jaganmohini or annapurnadevi or tukkadevi of tukkapanchakam???? ?